Driving Adventures in Mexico’s Huasteca – A 56 page coffee table guide book with a complete driving tour of the Adventure and Ecotourism Paradise that is the Huasteca area of Mexico. Includes areas in the Mexican states of: Tamaulipas, San Luis Potosí, Querétaro, Hidalgo, Puebla, and Veracruz. Includes information on White water Rafting, Kayaking, Mountain Biking, Rock Climbing, Swimming, Spelunking, Hunting, Fishing, Hiking, and Camping. With lots of historic and full-color pictures. DA – 105 – $16.95 Plus $7.95 International Shipping & Handling. Order by email: wjconaway@yahoo.com, or download from Amazon.com; Barnes and Noble.com; Kobo.com; or Google Play for a considerable discount. 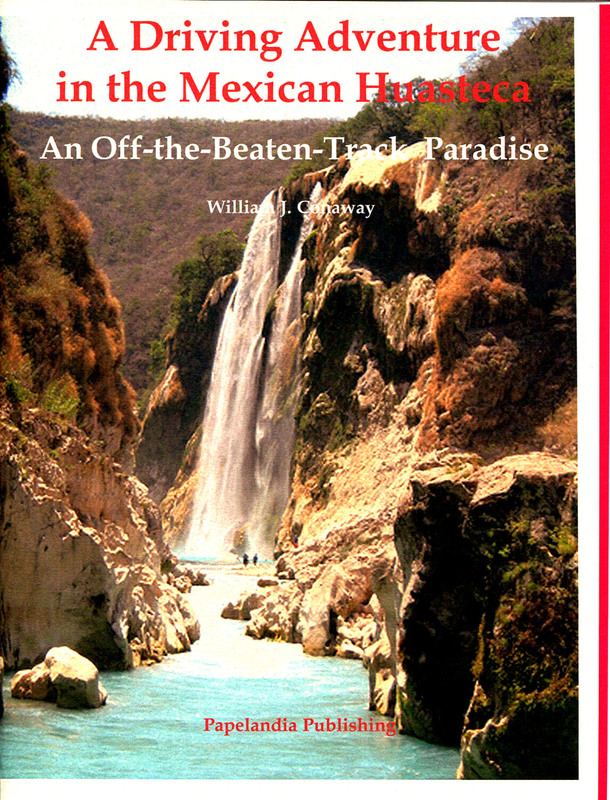 Tags: Adventures in Mexico, Huasteca, Mexico, San Luis Potosi, William J. Conaway. Driving Adventures in Mexico’s Huasteca – A 56 page coffee table guide book with a complete driving tour of the Adventure and Ecotourism Paradise that is the Huasteca area of Mexico. Includes areas in the Mexican states of: Tamaulipas, San Luis Potosí, Querétaro, Hidalgo, Puebla, and Veracruz. Includes information on White water Rafting, Kayaking, Mountain Biking, Rock Climbing, Swimming, Spelunking, Hunting, Fishing, Hiking, and Camping. With lots of historic and full-color pictures. DA – 105 – $16.95 Plus $7.95 International Shipping & Handling. Order by email: wjconaway@yahoo.com, or download from Amazon.com; Barnes and Noble.com; Kobo.com; or Google Play for a considerable discount. – A 56 page coffee table guide book with a complete driving tour of the Adventure and Ecotourism Paradise that is the Huasteca area of Mexico. Includes areas in the Mexican states of: Tamaulipas, San Luis Potosí, Querétaro, Hidalgo, Puebla, and Veracruz. Includes information on White water Rafting, Kayaking, Mountain Biking, Rock Climbing, Swimming, Spelunking, Hunting, Fishing, Hiking, and Camping. With lots of historic and full-color pictures. DA – 105 – $16.95 Plus $7.95 International Shipping & Handling. Order by email: wjconaway@yahoo.com, or download from Amazon.com; Barnes and Noble.com; Kobo.com; or Google Play for a considerable discount. Tags: Adventure Mexico, Adventures in Mexico, Huasteca, Mexico, San Luis Potosi, William J. Conaway. “An excerpt from my, “A Driving Adventure in the Mexican Huasteca”. The Huasteca is a huge area which includes parts of six States of the Mexican Republic: Tamaulipas, San Luis Potosí, Querétaro, Veracruz, Puebla, and Hidalgo. And it marks the migrations, some claim, of the Maya Indians by the end of the first millennium A.D. The result of these migrations, they believe, were the Huasteca Indians. But there are vestiges of occupation of the area dating from 1200 B.C. And archeological materials identify the formation of the Huasteca culture from 1,500-1,000 B.C. These Huastecan Indians developed their own culture and language, somewhat less remarkable than that of the Maya, but they achieved their cultural development early compared to the rest of Mesoamerica due to the abundance of fertile soil, abundant rain, and excellent hunting and fishing. At first the Huastecans depended on gathering, hunting, and fishing, but soon began to cultivate maíz, beans, and squash on the coastal plains. Their development was achieved in isolation from other influences, and by 1,000 A.D. they had mastered the art of ceramics. Many examples of their architecture, sculpture, ceramics, and delicate shell carvings are evidence of this singular culture. The Huastecan architecture consisted of round, stone platforms upon which they constructed their temples and homes of wood and thatch. These distinctive round tenecs served to free them from the frequent flooding of their coastal plains, and were not constructed in the higher Sierra. Remains of these types of structures remain in El Ebano and Tamuín. Given that few religious structures of the Huastecos remain today the complexities of their religion can mostly be seen in their sculptures. The Huastecan sculptures were mostly large masculine and feminine figures carved in sandstone, but examples of animals like snakes and birds have been discovered. Some of the most famous pieces are on display in various museums of the world. One, the Apotheosis is in the Brooklyn Museum in New York, and the Adolescent, pictured at left, is in the National Anthropology Museum in Mexico City. The Huastecans placed their gods on the three planes of the universe: Celestial space, Earthly space, and the Underworld. For centuries after the birth of Christ, the Huastecos had a complex religious structure in which their gods could be recognized by the clothes and ornaments that were depicted in their sculptures, showing where in nature they exerted their power. For instance a sculpture with a headdress that included sun rays, sacrificial spikes, and signs of the calendar was associated with the sun god. The fertility of the earth was deified in the form of a large breasted woman wearing a conical cap clasping her stomach, Ixcuina. The underworld deities were sculptures adorned with skeletal representations, bulging eyes, and in the process of giving birth signaling that life and death were also glorified. By 600-700 A.D. the Huastecas had established contact and trade with other peoples of Mesoamerica as established by a notable evolution in their sculpture and architecture. The limits of the prehispanic Huastecan empire has been traced as: on the north the river Soto la Marina, Tamaulipas; south to the river Cazones, Veracruz; on the east the Gulf of Mexico; and to the west the Sierra Madre Oriental up to an altitude of 3,250 feet. In 1454, the Aztecs, under Moctezuma Ilhuicamina, began the conquest of the Huasteca. The Aztec began to influence the Huastecan culture in subtle ways. Their customs, ideas, and manners of expression began to change. The wars went on with the Aztec rulers Axcayacátl, Tizoc, and Ahuízotl until in 1506, Moctezuma Xocoyotzin triumphed, and made the entire Huasteca his territory. The name Huasteca today is cultural in character. The ethnic identity of the Huasteca today is the product of four thousand years. A culture that played an important part in the formation of Mesoamerica. Today a mosaic of differing cultures and peoples who share, in common, the territory and a history. Their language, similar to that of the Maya, is still in limited use to this day. The population speaking indigenous languages represent about 20 percent of the total population of the Huasteca. The majority of the population is Mestizo with the mixture including mullatos, particularly in the coastal regions. The majority of place names in the Huasteca Potosina begin with the prefix Tam which translates as «place.» As in Tamazunchale, Tamuín, Tamasopo, etc. Interestingly the state of Tamaulipas that has a small portion of the Huasteca in the state has this same prefix. The different tribes during the Prehispanic era were: Teenek or Huastecos, Nahuas, Otomies, Pames and Tepehuas and to a lesser extent Totonacas and Jonaz. Today, the Huastecans, as in the rest of México, are practicing Catholics with the inclusion of some of the oldest superstitions on Earth, and a reverence for special places, waterfalls, caverns, sinkholes, underground springs, and roadside crosses, or in the old deities of water, wind, sun, moon, lightning, and the land. The dances of the Huasteca vary from place to place, but all identify with the Huapango music of the Huasteca. The traditional, colorful dress of the female Huastecas has become a representative symbol for the state of San Luis Potosí, pictured on page one. 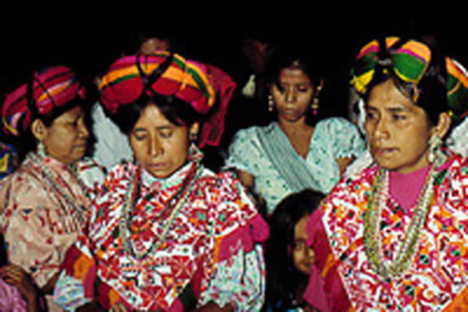 The municipality of Aquismon has the largest indigenous population in the Huasteca Potosina, there, the Indians continue to use the traditional manner of dress. The Gulf Coast was the first area of interest to the Spanish after the fall of Tenochtitlan. Francisco de Garay sent expeditions up the Pánuco River in 1520-21 when he was named governor of the region. These expeditions were greeted with violence from the native peoples. Not much progress was made in the conquest of the area until Hernán Cortéz, and his allied Indian armies, also began a land expedition leading an army into the region in October, 1522. A series of battles ensued from Huejutla de Reyes to Coxcatlán, and the Huasteca succumbed. Cortés then established a settlement, the Villa de Santiesteban del Puerto, today known as Pánuco, and distributed encomiendas, huge tracts of land, to his officers reserving for himself an area known as the Señorío de Oxitipa. In 1524, Nuño Beltrán de Guzman, with important connections in the Royal Spanish Court, took over as governor of Pánuco. Disappointed by not finding gold or silver mines he began trading in slaves that he sent to the Caribbean, even though slave trad­ing was strictly forbidden by the Spanish Crown. He nearly depop­ulated the entire Huasteca in the process of amassing his for­tune. In 1527, he was named President of the Primera Audiencia (the Appeals Court), and in 1529, he led an expedition to conquer Nueva Galicia, now Jalisco . His expedition, a murderous one, ended when his own officers reported his excesses to Spain. He returned to the Huasteca where, in 1533, he established the Villa de Santiago de los Valles de Oxitipa, the first Spanish settlement in what is now the state of San Luis Potosí, expropriating the lands of Hernán Cortés in the process. Eventually he was recalled to Spain. He was so influential, however, that he was never punished for his murderous ways. The population of the Huasteca finally returned to near normal levels in the XVII and XVIII centuries with better treatment of the Indians. The religious conquest was headed by Andrés de Olmos, a Franciscan who in 1554, created the Custodia de San Salvador de Tampico that settled the towns of Tampamolón, Tamuín, Tancuayalab, Tampasquín, Tanlajás, Tancanhuitz, Huehuetlán, and others. Settlement meant that a mission church was built, and along with these missions hospitals were built. Hospitals in those days were shelters where the Indians could camp in safety while they learned their new religion. Streets were laid out, and lots were allocated to the local Indians, the most important of whom were put closest to the church. Indian Caciques, or chiefs, ruled the population as usual with advise and consent of the Fathers, and plots of land with seeds and livestock were given for the growing of food, and the raising of animals. The Fathers encouraged the crafts, often teaching the Indians ceramics, woodworking, masonry, weaving, etc. The Augustins, in 1558, came into the region with Father Antonio de Roa, and Father Juan Estacio, «The Apostle of the Huasteca,» as he was later called. Father Estacio was very instrumental in the building of a convent and church in Huejutla de Reyes that later served as a Cathedral, and in the conversion of thousands of Indians. And in 1557, the good father built a convent in Xilitla. The construction of adobe with a thatch roof was destroyed by a Chichimeca raid the following year, but the convent was rebuilt of stone and stands to this day. He also built missions in Tamazunchale and Coxcatlán. 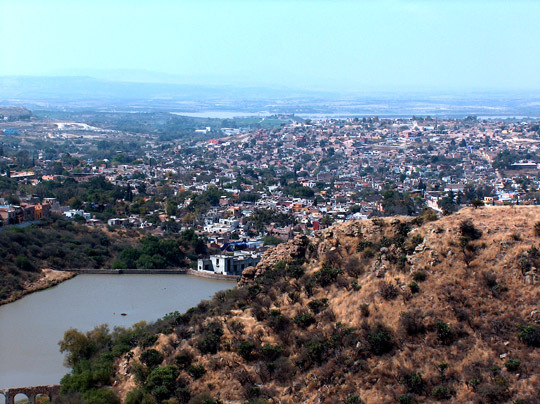 The region of Xichú was settled by Franciscan Fray Juan de San Miguel (founder of San Miguel de Allende) in 1542, and from there to Río Verde. Following in his footsteps, in 1549, Father Bernardo Cossin (Fray Juan’s second in command) went into the wilderness to find converts, and never returned, having been murdered by hostile Indians. In 1580, Juan de Tejo was named Mayor of what is now known as Cuidad Valles, and he extended the city limits to include Jalpan to the southeast and Matehuala to the north. 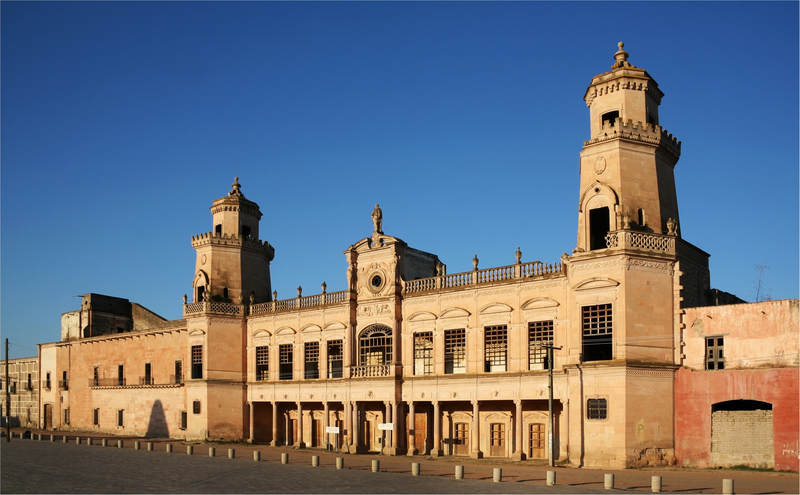 In 1787, it was included in the Intendencia of San Luis Potosí. 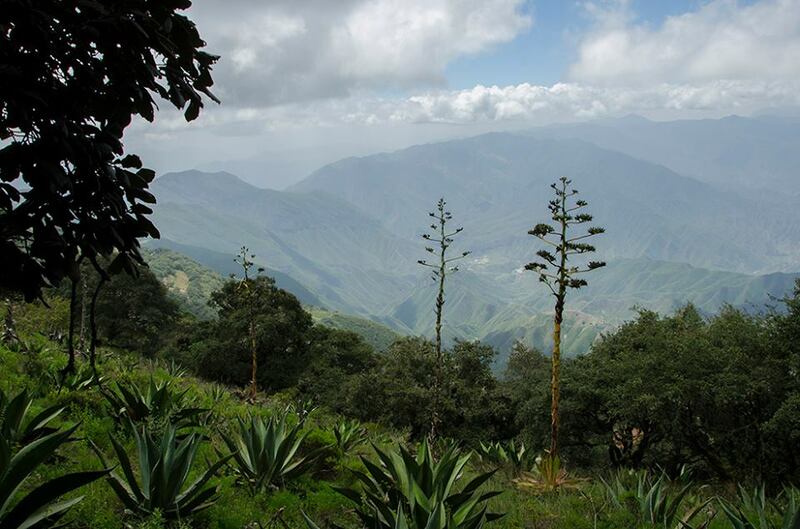 In 1592, Captain General Miguel Caldera and his army entered Río Verde to distribute food, clothing, and agricultural implements to the Indians in a pacification program he had initiated around the city of San Luis Potosí. A peace treaty had been signed with the Chichimecans (a grouping of bellicose nomadic tribes under one name which had been given them by the Aztecs) ending 39 years of war in 1589, and the Captain General traveled the region pacifying the remoter groups. 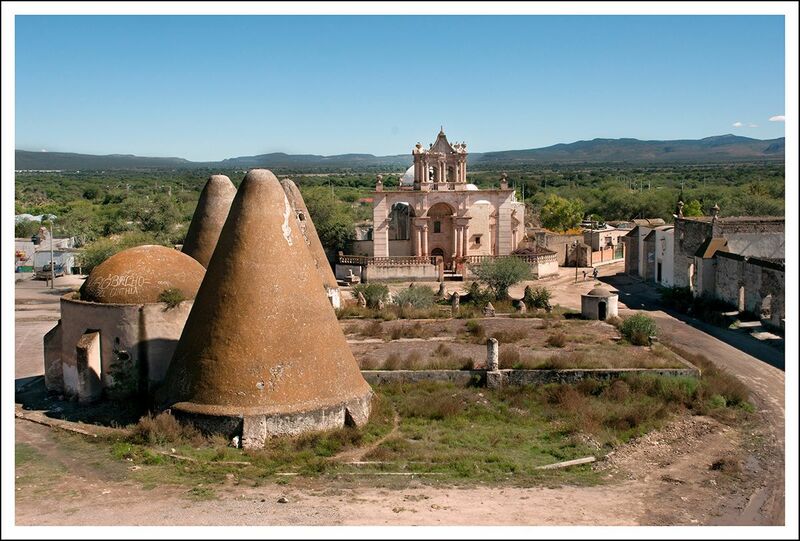 Through his efforts, in 1596, the first farming settlers, Otomis, were brought in from Querétaro. In 1607, Franciscan Juan de Cárdenas and Juan Bautista Mollinedo founded the Custodia de Río Verde, and by 1617, had built missions in Santa Catarina, San Antonio de Padua, Valle del Maiz, and many others. The War for Independence was brought to the Huasteca by an insurgent named Herrera whose small army came to Río Verde in 1811, with the Royal Army under the command of General Calleja hot on his heels. The battle moved on to Ciudad del Maíz where Herrera and his army were defeated. In Ciudad Valles, with the Royal Army based there, Father Pedro Alcántara, a beloved local priest, refused to permit any rebel activity, and there was none. Further south in the Huasteca, Serafín Olarte, an important Totonac Cacique, Indian chieftain, led the indigenous people of Papantla in an uprising against the Spaniards in his area. In 1817, the Spanish insurgent Francisco Javier Mina defeated the Royalist troops under the command of Colonel Villaseñor at Ciudad del Maíz on June 8, 1817. By the spring of 1817, the guerrilleros were active only in the states of Michoacán and Guanajuato except for Francisco Javier Mina and his foreign expeditionary force, which came from Galveston in the province of Texas, and landed with 308 men on April 21, 1817, at Soto la Marina, Tamualipas. Wealthy Londoners financed Mina’s expedition and he set sail for the United States in May of 1816, accompanied by 13 Spaniards, an Italian, and two British officers. In the U.S. he recruited more officers and men. In Galveston, Texas he published a declaration making known his intention to fight for Mexican Independence, and organized his Division into a well-trained group. He formed companies of troops that were to become the nucleus for regiments: The Regiment of the Union under Major Sterling consisted of 56 foreigners, wearing uniforms of the British army. The First Line Regiment consisted of 64 Mexicans, wearing uniforms of the U.S. Army Cavalry, under Major Meylefer, consisted of 124, mainly Mexican recruits; and there were five artillery men and five orderlies, with 12 fusiliers. Among Mina’s officers were valiant men destined to survive the expedition and occupy important positions. Lieutenant Colonel Juan Davis Bradburn became a General in the Mexican army, as did Captain Arago, and José Sardá whom would later fight with Simón Bolívar in South America. With this handful of men Mina embarked on one of the most daring undertakings that has ever been conceived, defying all the forces that the Viceroy of New Spain could put up against him. In ensuing battles, with the other Insurgents at their side Mina’s group gradually lost all of their experienced officers and the fighting became more and more futile until Mina, after nearly seven months, was captured and executed on November 11, 1817. On May 23, 1821, a famous Huastecan, Brigadier General Juan José Zenón Fernández proclaimed for the Independence Plan of Iguala in Río Verde, and forming a division attacked and defeated the Royalist Army in Tula. Serafín Olarte, a Tontonac Indian from Coyuxquíhu, Veracruz (38 kilometers from Papantla), joined the War for Independence on the side of the Insurgents in 1813. By 1815, after the capture and execution of the other rebel leaders (Hidalgo, Allende, Morelos, etc. ), only Olarte and Vicente Guerrero remained in play. But in 1821, before Independence could be realized Serafín Olarte was captured and executed by the Royalists. Mariano Olarte, also a pure blooded Tontonac, followed his father’s example, and became a popular leader of his people. After his father’s death he continued the struggle, but then he heard that Spain was adopting a more broad-minded constitution. Conservative, royalist officers in Mexico took that moment to come out for independence, and young Olarte accepted amnesty on the grounds that Spain was adopting the principles the Independence Movement had been fighting for. This put him briefly in opposition to insurgents like Guerrero, who were willing to work with Iturbide. But he regained his footing quickly enough, and again joined the larger independence movement. During the 1820s, promotion boards in the new army, made up mostly of former royalists who had opted for independence at the «right» time, never wanted to give Olarte a rank higher than captain. Only under pressure from Guadalupe Victoria himself, who had landholdings in Olarte’s neighborhood, did Olarte win the rank of lieutenant colonel, and with it the leverage to expand his political standing. He legally picked up his father’s role as a paternalistic Cacique in the area around Papantla, Veracruz. Distrusting the military bureaucracy that had mistreated him, feeling more like a Guerrero than a Santa Anna, he had good reason to support the Federalist cause, but also to back his own people against any government. Late in 1835, while the Texas conflict was coming to a head, the Federalist exile Jose Antonio Mejia led a paramilitary expedition from New Orleans to take over Tampico, just north of Olarte’s home ground. Mejia had dubious connections with the Anglos in Texas, but Olarte reacted to the little expedition as if it were a genuine Federalist revolt within Mexican politics. Putting himself on the scene, he handed over the main harbor fort to Mejia’s band of adventurers, and promptly discovered that he had picked the wrong side. Some members of the Tampico garrison rejected the deal, organized a successful resistance, and threw the filibusterers in jail. Those of foreign nationality were summarily shot. Olarte fled, going into hiding at a time when neither Federalists nor Centralists wanted to admit having anything to do with the Texas rebels. Like Guerrero in 1830, perhaps like many a dissident captain on the run, he had nothing left to do except commit himself to a cause of the people against the government. The National Political turmoil between Federalists (States Rights) and Centralists (Central Federal Government) was being used locally as an excuse to acquire land, seizing that of the indigenous people who lacked the resources to fight for it. And Olarte demonstrated to the people that the local Federalist slogans were no more than a pretense to cover paramilitary expe­ditions for other loot. November 5, 1836, a revolt began in Papantla, starting with complaints against one government official whom locals accused of smuggling. The rebels demanded that ranchers stop pasturing cattle on barren land next to Indian’s fields, which only led to the animals breaking down fences to get at their corn. They defended their local priest against outside attacks, but they demanded the restoration of their «old processions,» which the Bishop had prohibited. In church money matters, the rebels were willing to preserve the system of tithes, which would draw proportionately on the wealthy hacendados to support religious functions, and they were willing to see the clergy charge money for voluntary or luxury services. But they demanded an end to all fees for routine masses, or for rites like baptism and marriage that were a part of people’s lives. At the stage when their formal Plan de Papantla was articulated, it also included demands relevant to national politics: a return to the Federalist Constitution of 1824, and the exclusion of imports that competed with domestic products (like cotton cloth). The revolt was suppressed, though not quickly or easily. Olarte’s rebels did not depend on Veracruz for access to the outside world, but could use the outlets of local rivers, adequate for shallow-draft vessels. Thus, they were a line of contact between the insurgents and the outside world, including exiles in New Orleans. The government sent in troops, alleging that the revolt was supported by conspirators linked to Texas. At first, the townspeople used their own techniques to make the government commander look silly. He could defeat the rebels in open ground, but found his way suddenly blocked in all directions when he pursued them: they had cut trees almost ready to fall, held up only by vines, and could quickly finish felling them when their own troops had passed up into the narrow canyons. When the government troops took Papantla itself, burning peasants’ houses and demanding supplies, the population simply took to the up-country, leaving the government troops with no supplies, and establishing a rough blockade around the town. To save themselves, the government forces finally had to call in Guadalupe Victoria, the ex-President, to mediate. The ex-President took up headquarters in Papantla, talked some to Olarte, but more to his lieutenants and to the villagers. Finally he persuaded the bulk of them to come down from the hills, giving them reassurances about many of their practical grievances, but leaving untouched two points on which it was impossible to be precise: the restoration of the «old processions,» which the Bishop insisted had nothing to do with politics, and the restoration of a Federalist government. The people were pacified with words about their economic grievances, and with an end to the fighting, but Olarte was left to wander in the mountains with a tiny patrol. For two years he evaded the army’s pursuit, keeping in touch with Federalist rebels like Gen. Esteban Moctezuma. His little force eroded under constant pressure, until the day came when he was trapped and killed. In 1835, a Native of Ciudad del Maíz, Miguel Barragán, became President of México. He served only for two uneventful years inbetween the 10 terms of Santa Anna. In 1845, the Custodia de Río Verde was closed bringing to an end the evangelization efforts of the Franciscans, and bringing about the secularization of the paroquial churches of the area. In 1849, Río Verde became the center of the, «Revolution of the Sierra Gorda,» a Liberal, Socialist, barracks rebellion for reforms. The Revolt was put down by the troops of Anastasio Bustamante, previously twice President of the Republic. During the War of the Reform 1857-61, a Liberal (anti church) vs. the Conservative (pro church side), struggle for power, Conservative General Thomás Mejía took Río Verde in a hard fought battle and captured Liberal General Mariano Escobedo. After the revolt against Porfirio Díaz succeeded, and the War of the Generals, as I call it, began (Carrancistas vs. Villa and Zapata) an illiterate Mestizo, Saturnino Cedillo, rose up on the side of Carranza. He was to become an important man in the state of San Luis Potosí, and in the Federal government eventually. Saturnino Cedillo and his brothers, Magdaleno and Cleofas, born in Ciudad del Maíz, gathered an army, and began their struggle in 1912. (Cedillo a peasant leader, another Zapata, was later to become a wealthy feudal landowner, and a defender of the Catholic Church.) General Cedillo was to become the Cacique of the entire state of San Luis Potosí for the next 20 years, ruling with an iron fist, backed up by his army of loyal followers. Cedillo served as Governor of the state from 1927-31, and served as a Cabinet officer in the Federal Government of Lázaro Cárdenas. However, in 1938, having been asked to give up power in San Luis Potosí, he and his followers rose up against the Federal Government. The Church gave him no support, and the movement was easily suppressed within a few weeks. In this exciting region one can go White Water Rafting, Kayaking, Mountain/rock Climbing, Hiking, Camping, Mountain Biking, Rappelling down past rushing waterfalls or into huge sinkholes, and Spelunking. 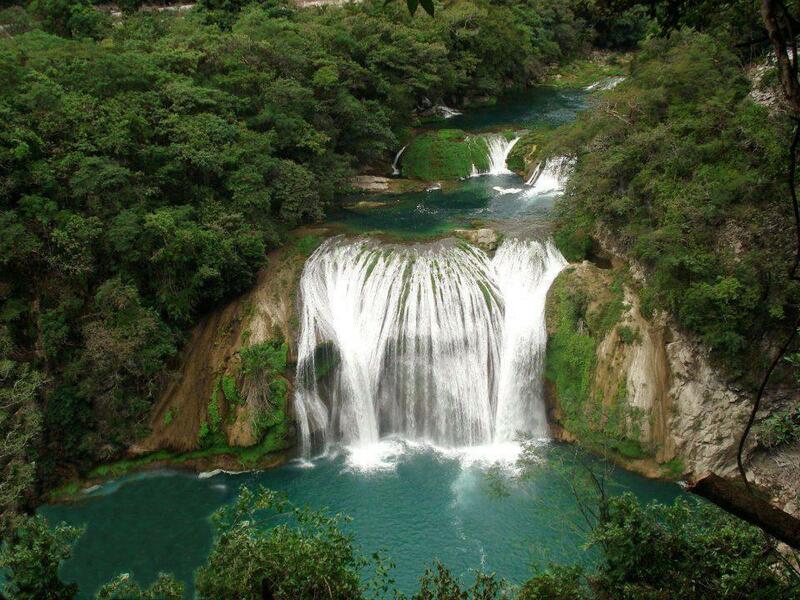 More than seven different rivers wind through the Huasteca Potosina. They are clean and clear, with water temperatures between 70-85 degrees. The vegetation is lush and green with parrots flying overhead. Iguanas run across the trails and turtles bask in the sun along the river banks. The countryside is rough, but most of the rivers are within just 40 miles of Ciudad Valles. 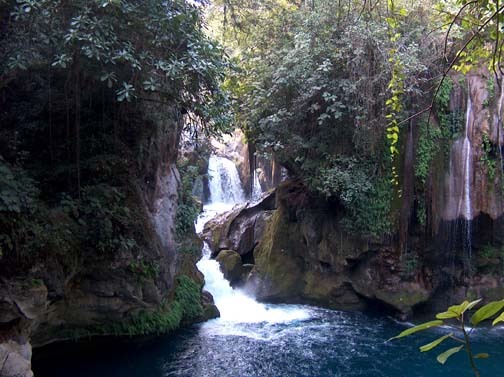 The Huasteca Potosina includes the world famous Río Santa Maria and its tributaries, one of the most beautiful white-water rivers in the world. Its rapids range from towering waterfalls to turquoise blue water, and spectacular rock-gardens. The forests around the Santa Maria are lush and green, with flowering trees and moss covered cedars lining the riverbanks. 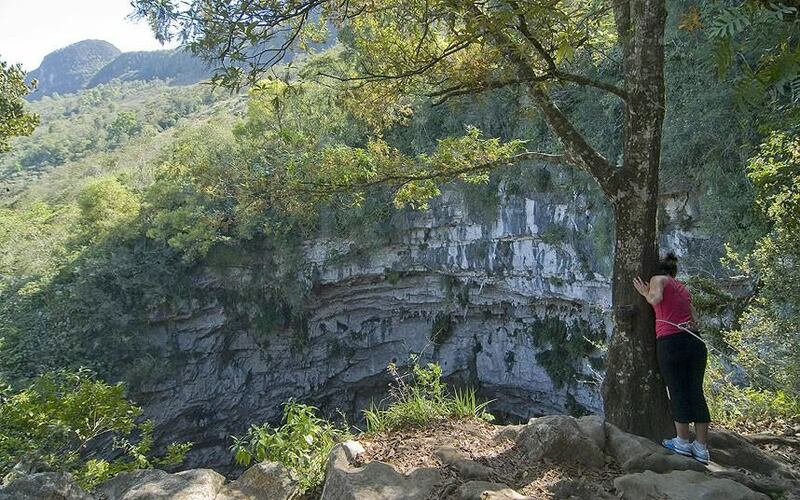 The famous Tamul Sinkhole is just one of the natural wonders of the area. Just to the south are the northern most reaches of the American Rainforest. The best white-water runs on the Santa Maria are the Rincon Grande and the Tamul Canyons. Rincon Grande is mostly a straight forward, class three rapids formed by the natural incline and the narrow canyon walls. The White-water in the Tamul Canyon consists of giant boulder gardens. The lines are tight and the drops steep. Don’t be fooled by the mellow gradient of 21 feet per minute. This is a true pool drop river. There are eight significant rapids in this canyon along with another dozen smaller rapids. Three are big, class fives requiring respect. With a few quick portages these two canyons can be run in a fairly easy day. The Santa Maria is white-water wonderland with easy logistics and within the ability of most intermediate paddlers. The highlight of the run is the 240 foot wall-to-wall Cascadas Tamul, but what makes it even better is the Tamul Sinkhole just upstream. If the Gallinas River is high, the one forming the Tamul waterfall, you won’t be able to paddle under the falls. This isn’t a problem. There’s a trail going up the side of the falls which leads to a road. The Rio Verde river runs through a narrow basalt canyon with rock-gardens, micro-gorges, and a number of waterfalls. A classic white-water river. The run leads to Puerta del Salto, a spectacular 40-foot waterfall. The Upper Río Verde, is a fantastic adventure for advanced paddlers. It begins in a narrow gash in the earth, and cuts through a spectacular gorge of waterfalls, rapids, with stunning scenery. The portages, however, are difficult. All the rapids except one have been run. Small earthen dams and flower covered islands make the Gallinas a beautiful intermediate run. The run starts slow with long pools between each falls, but towards the end of the run the rapids become closer together and somewhat more difficult. El Salto is a classic blue water run of short steep rapids and waterfalls. It’s an all-around favorite due to the incredibly warm water, and the picturesque scenery. Be sure to hire a local guide. Micos is the kayaker’s dream of waterfall fun. Ranging from 10 to 25 feet, the seven falls of Micos are a kayaker’s paradise. From novice to expert Micos is guaranteed fun for every level kayaker, and below the falls there is a wonderful series of rapids. Below Tamul the Santa Maria changes names to the Tampaon, or as the locals call it: Puente de Dios. The river flows through a wide open valley before entering Caon Tampaon. This is a narrow gorge of swirly single drop rapids. A good intermediate run. The outstanding feature of the Tampaon is the actual Bridge of God, a spring that has carved out a natural stone bridge. The Puente de Dios runs through a 2,000 foot deep jungle canyon. Parrots fly through the tree tops, and alligators lounge in the lower pools. Be careful about swimming here. There are eight class III rapids. When the water is high they become quite powerful, and some lead right into the next. The Teenek, numbering some 120,000 occupy a portion of northern Veracruz and eastern San Luis Potosí with a 20-40 thousand scattered amongst the Nahua (Remnants of the Aztecs) towns of Aquismon, Tancanhuitz, Tampamolón, Tamauín, Ciudad Valles, and El Ebano. Life for the Teenek communities revolves around the planting of maíz and beans, the gathering of the plentiful fruits of the semi tropical zone in which they live, and in the weaving of Cabbage Palm and Royal Palm fronds into bags, hats, and various kitchen implements used by Mexicans everywhere. Some engage in ceramics, and they also raise turkeys, chickens, pigs, and cattle for the sale of eggs, milk, and meat. Many of the younger members of the community work in the surrounding towns and cities as day laborers, returning on weekends to the family home. The Teenek regard the man and the woman as equals, and all engage equally in the necessary economic and household pursuits. The year is divided by the weather, the winter is spent repairing their homes, gathering fire wood, and amassing the raw materials for the crafts that they manufacture. Their festivals occur mainly during the winter months, and are a combination of Catholosism and Paganism. The Teenek, more than any other indigenous group of the Huasteca, engage in dancing rituals. The Malinche, Los Negritos, Las Varas, El Gavilan, and Los Espejos are just a few of their traditional dances. The famous Sundance of the Totonac Flyers is said to have come from the Teenek, who don’t now engage in it. The women are the only ones who still continue using the traditional manner of dress. And some of the men wear white, cotton shirts and pants everyday with embroidered ones during fiestas. The young, of course, shun the traditional manner of dress in favor of jeans and colorful shirts common in the rest of Mexico. The Totonac Indians at the time of the Spanish Conquest an are consisting of all, except a small strip of land in the north, of the present state of Veracruz and a small portion of Puebla. The Totonacs were the first natives to greet Hernan Cortés when he first landed in México in 1519. The Totonacs had been subjugated by the Aztecs and were compelled to pay a heavy tribute of food and trade goods not to mention slaves and human sacrifices to the Aztec gods. Their capital, located about five miles inland from the present site of the city of Veracruz was named Cempoala, had a population of about 25,000. It was here that Cortéz was received. The Totonac king at that time, Chicomacatt, eagerly agreed to ally himself and his 50,000 warriors with Cortés against the Aztecs. And immediately seized the Aztec tax gathers for execution. Cortéz intervened, and ordered the Totonac’s wooden gods destroyed. The Totonac were outraged, but when they witnessed the simple, beautiful ceremony preformed by Cortéz’ Catholic priest, and comparing it to their bloody worship the Totonac were impressed. Baptisms were begun immediately. Christianity’s first victory in México. The Totonac’s assisted in laying out the first town in Nueva España, Villa Rica de la Vera Cruz. Cortés made this settlement his headquarters, and from there started out to engage Moctezuma in his capital city, Tenochtitlan. During the subsequent war waged against the Aztecs, the Totonacs and Tlaxcalans took an active part. They were rewarded with titles, land, and future participation in the conquest of the rest of the country. The Religious Conquest of the Totonacs was given over to the Dominicans who built missions in Veracruz and Puebla. The Dominicans led the fight against Indian slavery, and had their work cut out for them in the Huasteca with the likes of Nuño de Beltrán de Guzman in control. The modern Totonac are industrious farmers, their chief crop being sugar cane which they process in their own mills. They are also accomplished fishermen. Like the Teenek, they are given to dances and festivals, and their festive garments are also embroidered white cotton. Their most famous dance is the sacred, Sundance. The four dancers and the Priest or Shaman dance around the base of an up to 80 foot pole sunk in the ground. The Priest is dressed in red and white to represent the sun and wears a rainbow headdress with mirrors to reflect the sun. All five dance around the pole stopping at the four Cardinal Points to ask permission for the dance to proceed. The four «Flyers,» climb the pole, and position themselves at the four corners of a tiny eight inch drum that rotates around on top of the pole. The pole represents the connection of heaven to Earth, an earthly connection to the Divine. The Priest is last to climb the pole. Once at the top he begins his prayer song playing his flute, and as he dances around and around he stops at the four Cardinal Points. He has no safety line, no net, trusting his god to help him keep his balance. His footfalls and drum beats, that he plays on his tiny instrument, represent the heartbeat of Mother Earth. His dance finished the Priest sits down on the rotating drum and the four flyers fall backwards into the open air and with their legs gripping ropes begin a slow spiral of the pole to the Earth. They make 13 revolutions representing Venus, the morning star, and her influence on the Earth. (The symbolism is tied to the ancient’s intimate knowledge of astronomy [4 X 13 = 52 Fifty-two represents Venus]. And the four Flyers wait at the base of the pole for their Priest to descend using the rope, the umbilical cord. This area has some of the most unusual, delicious recipes of the entire Republic. They are holdovers from the Pre-Hispanic era, and are popular to this day. Be sure to try them while you are there because you won’t find them anywhere else. The Zacahuil, is a huge tamale (about 6 feet long) made of the usual maiz dough, mixed with chili laced pork, and baked in a wood oven wrapped with banana leaves. The Bolim, is a smaller version filled with chicken or turkey meat. Cecina, is a salted, sun dried meat, pork, beef, or venison served in a chile ancho or cascabel sauce. Caldo Loco, Crazy Broth, is a soup made with different kinds of meat combined with fruit and vegetables in a chili sauce. Palmito, Hearts of Palm, are known to gourmets world wide. They are a wonderful delicacy made from the heart of the Joshua Tree. Pemoles, are a cookie made from ground pine nuts, and flavored with piloncillo, a molasses/brown sugar syrup, and sprinkled with sesame seeds. Other Dishes Include, Tamales de Chilpan; Enchiladas Huastecas, made with cecina; Bocoles; Patlache, another tamale; and Acamayas, or fresh water crawfish. Tags: Adventures in Mexico, driving adventures, Google, Huasteca, Mexico, William J. Conaway. Driving Adventures: Day Trips From San Miguel – A 56 page coffee table style guidebook to easy one-day trips with historic and full-color pictures. 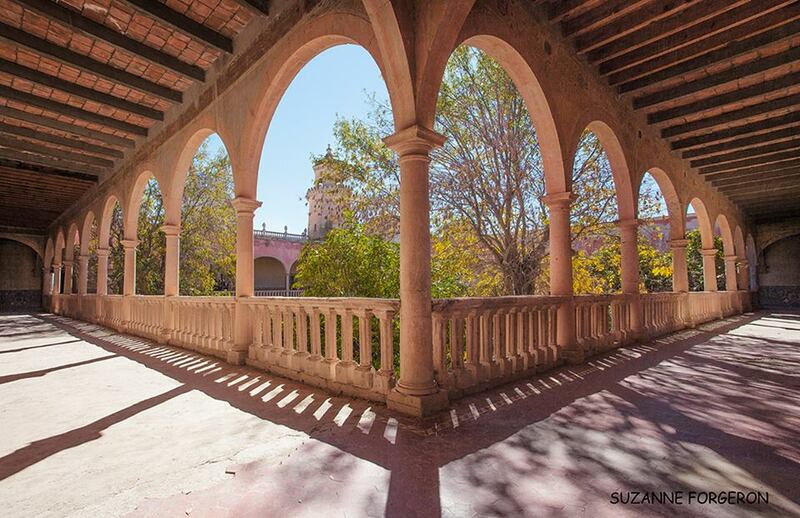 Visit Acambaro, Guanajuato’s oldest city; Dolores Hidalgo, the Fountain of the Independence movement, La Luz, Guanajuato’s Other Ghost Town; Cerro de San Pedro, San Luis Potosí’s Ghost Town, and Jaral de Berrio, the ruins of an historic Hacienda. DA – 102 – $16.95 Plus $7.95 International Shipping & Handling. Order by email: wjconaway@yahoo.com, or download from Amazon.com ;Amazon.com.mx Barnes and Noble.com; Kobo.com; or Google Play for a considerable discount. Tags: Dolores Hidalgo, driving adventures, Mexico, San Luis Potosi, san miguel, William J. Conaway. Tags: Dolores Hidalgo, driving adventures, San Luis Potosi, san miguel, William J. Conaway.